Here are some great sketchnotes from Ruud Cox captured at the Third Dutch Exploratory Workshop in Testing (DEWT3). I'm loving the use of blue ink on kraft style paper with color highlights here and there. The first image is a poster Ruud made, the second and third are his workshop sketchnotes. I take notes all the time. I carry a paper notebook with me that I use at meetings, workshops and conferences. I also use it as a diary and for capturing ideas. After reading The Sketchnote Handbook: the illustrated guide to visual note taking recently, I decided to give sketchnoting a try at the third Dutch Exploratory Workshop in Testing that took place over the weekend 20 – 21 April 2013. 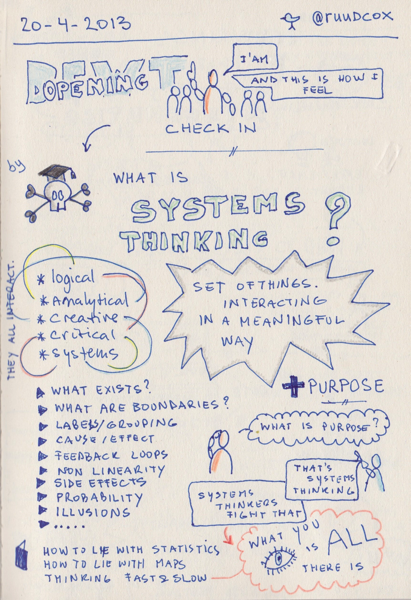 From Ruud's article on the DEWT3 sketchnotes at his blog.